Only twelve hours ago, we didn’t know this place existed. We had decided to run down to Seattle for the afternoon and pick up some necessary framing materials. I had recently received an email from Seattle Metropolitan featuring good lunch spots, so I pulled that up to look over while we were getting our stuff together. 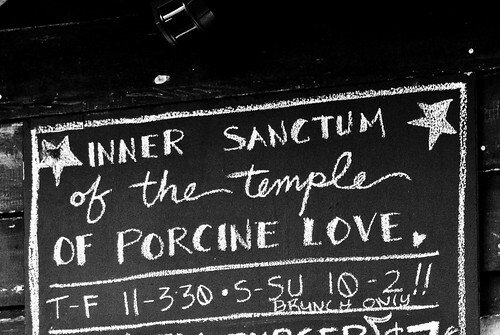 The Inner Sanctum of the Temple of Porcine Love immediately made itself known as the place we needed to have lunch. Today. As it turns out, this place is a recent adjunct to the quite fabulous little butcher/charcuterie shop The Swinery. 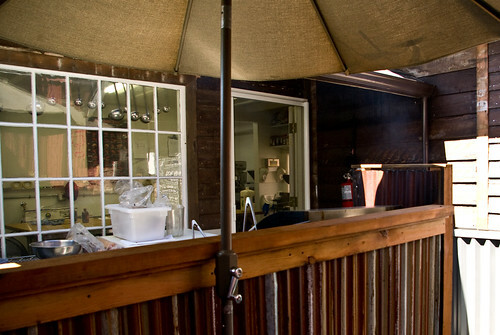 It’s rather like the old Pok Pok in Portland, back when it was just a takeout stand in someone’s driveway. You order your sandwich, eat it on a bench in the narrow courtyard, and pay for it in the shop (where, if you’re like us, you will instantly succumb to the lure of gorgeous charcuterie as well). They’re doing it as a bit of a trial run, to see how it goes. How was the food, you ask? Hmmm. Jon got the Swinery Burger with caramelized onions and Swiss cheese, cooked medium rare. I got the Carolina pulled pork sandwich, which was so rich and smoky it didn’t need sauce (except for mayo, which I can’t live without). Both were fabulous. I was especially impressed with the bun, which was soft enough to squish down over the meat but didn’t dissolve into mush, and had been nicely toasted. 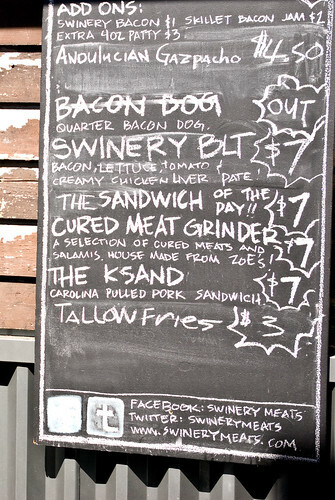 My only regret is that I wasn’t able to try the BLT or the tallow fries. West Seattle isn’t on our usual route, so I’d just like to put a call out to anyone in the area – check this place out! Give them enough business to consider making it permanent. 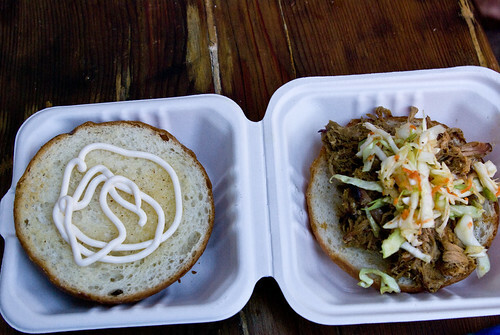 The world needs more really great burgers and pulled pork sandwiches. Not to mention duck chorizo. I can honestly say that the burger was among the best I have ever had. 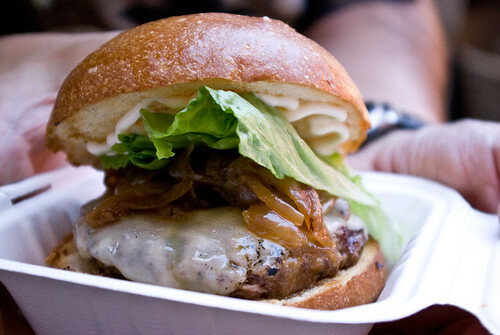 I only wish that I had seen on the menu that I could add Skillet’s bacon jam to the burger. Can we go back? Soon? Y’all were in my neighborhood! Next time give a call. I’ll take you to a couple of other good spots. We were thinking we should have shanghaied you! This was a last second decision, next time we’ll give you a holler.